The museum of the outstanding writer Mikhail Bulgakov is situated in one of the most beautiful streets of Kiev, Andreyevsky Spusk, which was mainly built up at the end of the 19th century. The street is also famous for some older constructions that are considered to be of great historical value. For example, the famous Andreevskaya Church, dating back to the 18th century, is located here as well. Building number 13 was designed by architect I. I. Gordenin over a century ago. Bulgakov and his parents moved to this house in 1906 and lived there until 1919, when they were forced to leave the city, due to the «time of troubles». Later in this very house the writer settled the main characters of his famous book «Belaya Gvardia», or «The White Guard». Several decades later Victor Nekrasov, a well-known literary critic and a writer, published an essay called «At the Turbins», devoted to the life and creativity of Mikhail Bulgakov. The name of the essay turned out to be so becoming that the building at 13 Andreyevsky Spusk got the new name and under this name went down in the city folklore. 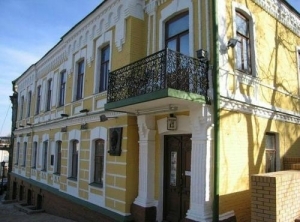 Nowadays the legendary house is one of the most famous landmarks of Andreyevsky Spusk. The Memorial Museum was founded in 1989 as a branch of the State Museum of Kiev's History. On May 15, 1991, the centenary since the writer's birth, the museum was open to the public. The solemn ceremony of the museum opening was started with the memorial service in Podol Krestovozdvizhenskaya Church, where little Mikhail, who was to become the pride of Russian literature, was christened. The private collection of Anatoly Petrovich Konchakovsky, the founder and the director of the museum, laid the groundwork for the museum's collection. Many relatives and friends of Mikhail Bulgakov donated priceless heirlooms, writer's personal belongings, books, autographs and original photos to the museum. Thanks to them the museum boasts not typological, but authentic things, preserving the spirit of that time and recreating the atmosphere, in which Mikhail Bulgakov wrote his best books. The permanent exhibition of the museum is devoted to two families, the Bulgakovs and the Turbins, as well as to the author and his characters. It is important to mention that the design and of interiors and decorations have been carefully recreated according to old photos and drawings. Admirers of Bulgakov's books and those interested in literature are welcome to Turbins' House daily, except Wednesday, from 10 a.m. till 6 p.m. in summer and from 10 a.m. to 5 p.m. in winter.